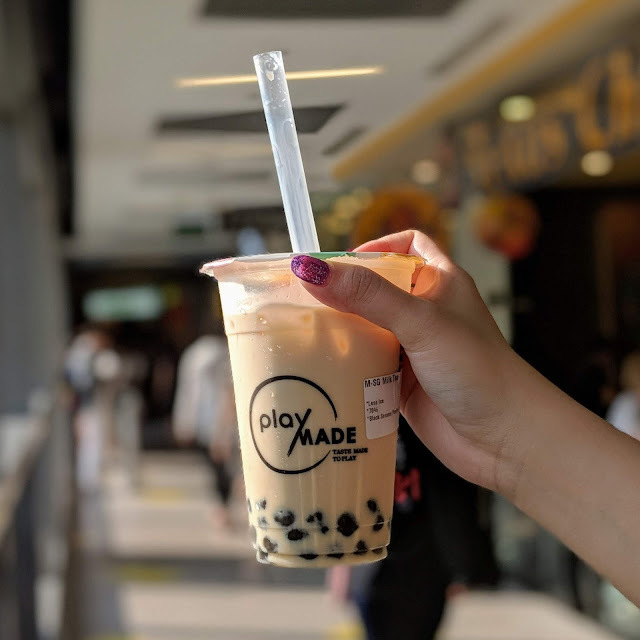 PlayMade Bubble Tea - Enjoy Teh Peng with freshly made Black Sesame Pearls! 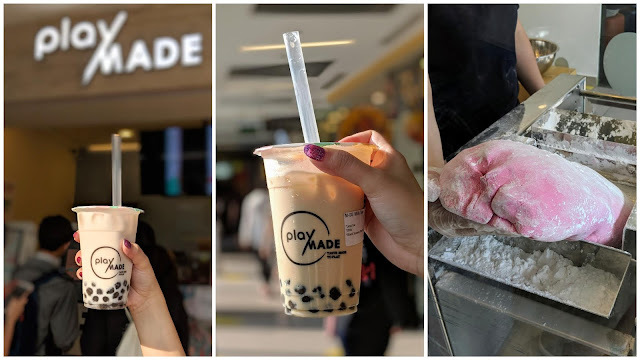 Duckie has been raving about this amazing bubble tea that she has tried recently - PlayMade. I was thinking how amazing a bubble tea shop could be. It is not just another bubble tea shop. It is truly amazing. Let's start with the name. 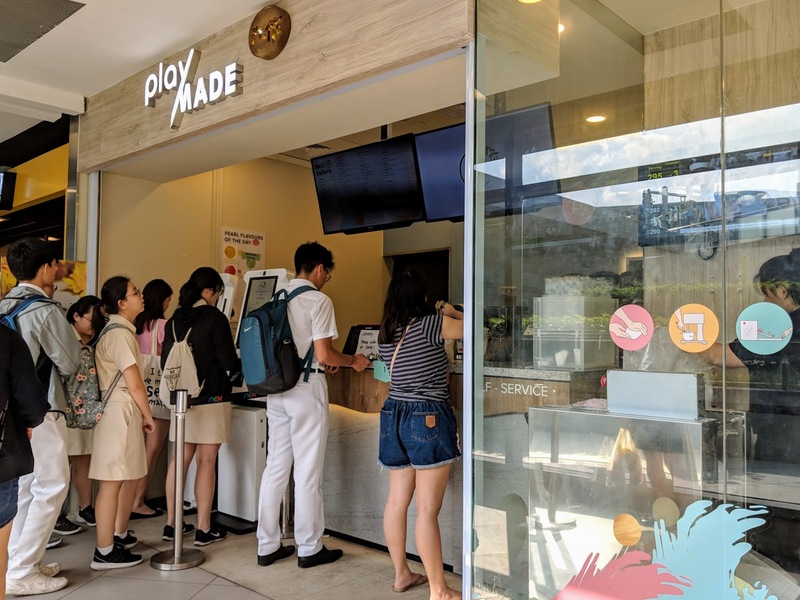 Are you wondering why a bubble tea shop is called PlayMade? 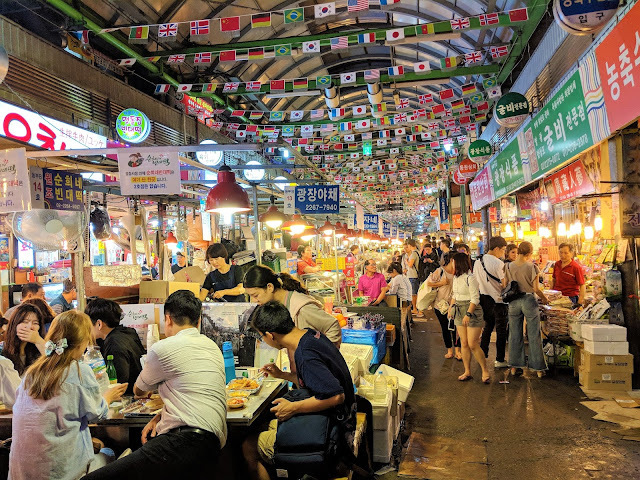 It is inspired by its origins in Tainan, Taiwan. 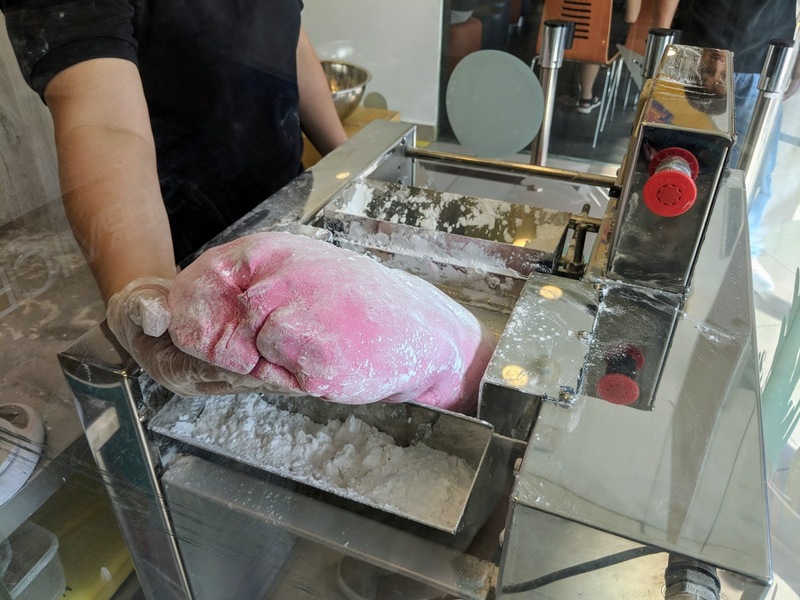 It is known as 丸(wan)作(Zuo) - Balls Make, as the bubble tea shop makes its own tapioca balls. I guess Balls Make sounds too vulgar so the English translation took on another Chinese character with the same pronounciation - 玩 (wan), which means play. 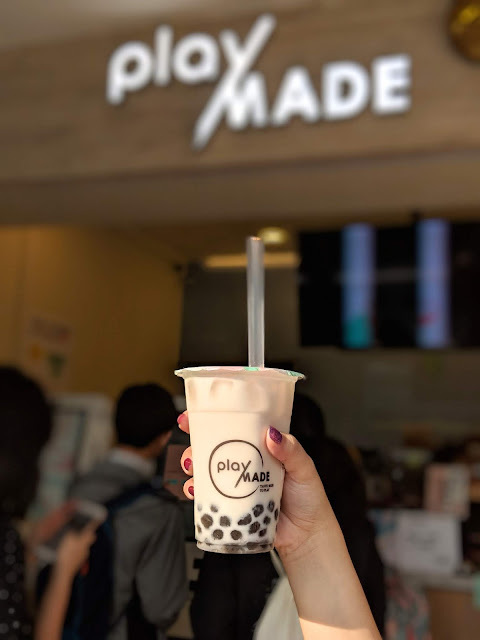 PlayMade has pearls (tapioca balls) of interesting flavours such as Burnt Caramel, Black Sesame, Pink Cactus, Chrysanthemum. Today, I tried the Black Sesame, highly recommended by Duckie. The Black Sesame pearls were delicious. They were very fragrant and complimented my Brown Rice Tea with milk perfectly. The Brown Rice Tea was amazing. It tasted like the usual hot brown rice tea that I drink after a heavy meal to aid in digestion. It was such a pleasant surprise that it tasted delicious with milk. Drink of the Day - SG Tea with Milk! I am most amazed with the SG Tea with Milk. After I have taken a sip, I realised why it is called SG Tea. Oh my gosh! It is a very authentic version of our local Teh Peng! I enjoyed both teas very much and I look forward to your comments below, sharing your experiences with the other flavours. 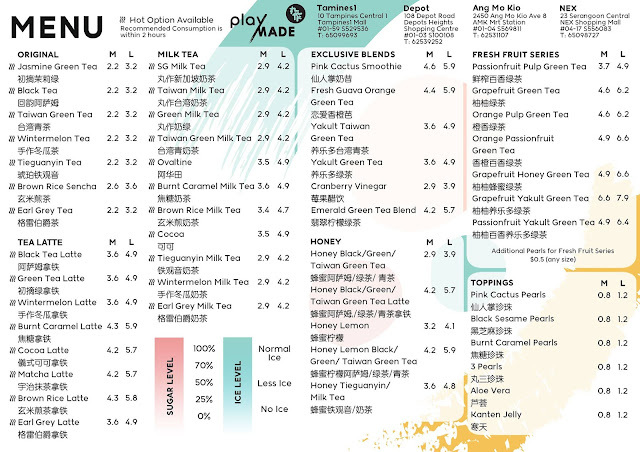 From Milk Tea to Fresh Fruit series, there seems to be a drink for everyone on the menu! I am very excited for PlayMade. Pearls are made on the spot with natural ingredients! This was the first time I saw a live-making process of the tapioca balls - pearls. Cute! The fact that the pearls are made on the spot straightaway sets PlayMade apart from its competitors. Who can resist freshly made pearls? PlayMade mentioned on its Facebook Page that they pride themselves in "ensuring that everything is made by hand, and with all-natural ingredients." For instant updates on food and travel, please follow mysassyfoodblogger Instagram and Facebook.